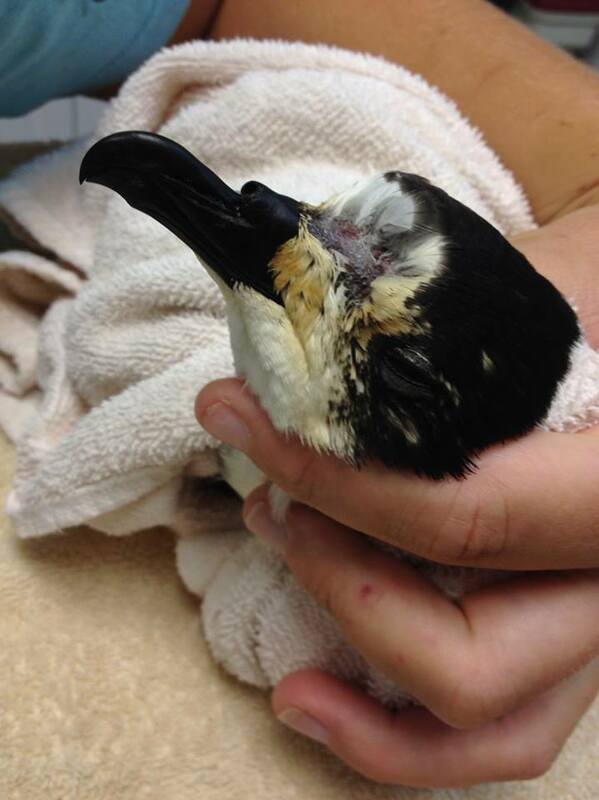 On July 13th of 2016, this endangered Hawaiian Petrel came into SOS after having obviously collided with an object. The left side of his/her head was swollen and he was keeping his left eye shut. Following several days of care which included medications and a wash (his face and head were not waterproof), the bird had fully recovered other than missing a large patch of feathers on his head. In partnership with Kaua'i Endangered Seabird Recovery Project, a satellite tag was affixed to his back prior to release and on July 17th he was released from Makahuena Point. He had a brood patch and it was hoped that he would return to his burrow to breed. He, however, had other plans. 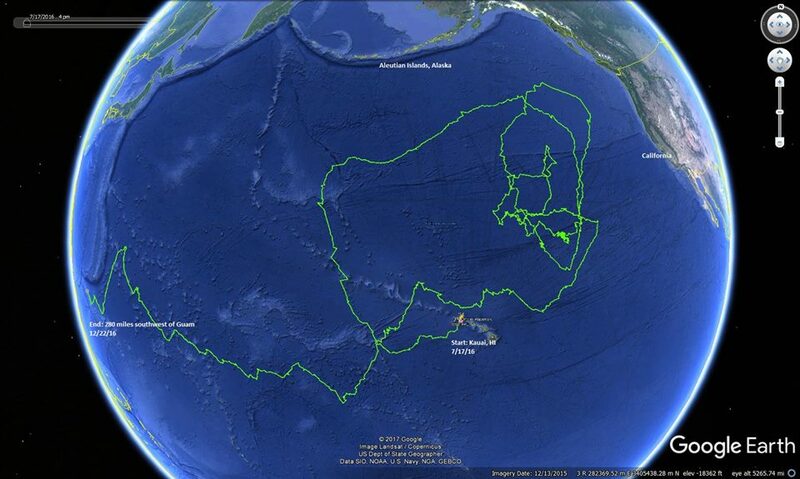 We tracked this bird for a total of 159 days and in that time he flew an amazing 48,140 km (29,912 miles)! For reference, that is 5000 miles more than the circumference of the Earth at the equator! Save Our Shearwaters works with the Kaua‘i Endangered Seabird Project to put satellite tags on fledgling Newell's Shearwaters during fallout season. The first batch of Newell's Shearwaters were tagged in 2014. Since then, we have continued to work together to tag birds in 2016 and 2017. The data collected helps to reveal where these fledgling Newell's Shearwaters travel when they head out to the ocean for the first time. There had been no prior research on where fledgling Newell's Shearwaters travel to before these studies began in 2014. In 2016, Save Our Shearwaters provided vital information regarding grounded seabirds for a metadata study titled Seabird mortality caused by land-based artificial lights (Rodriguez et al. 2017). This study helped to compile data on grounded seabirds to discover information gaps and potential measures to mitigate the effects of artificial lights. The study found that without rescue organizations over 200,000 birds would have died worldwide due to light pollution since the organizations were established. In 2016, a study was published by Elizabeth Kain, Jennifer Lavers, Carl Berg, Andre Raine, and Alexander Bond titled Plastic ingestion by Newell’s (Puffinus newelli) and wedge-tailed shearwaters (Ardenna pacifica) in Hawaii. Save Our Shearwaters provided frozen specimens of Newell's Shearwaters and wedge-tailed shearwaters for Kain to study. The study concluded that 76.9% of wedge-tailed shearwaters fledglings, 50% of Newell's shearwater fledglings, and 42.1% of adult wedge-tailed shearwaters that had been necropsied from 2007-2014 had ingested plastic. This conclusion is worrying due to the increased amount of ingested plastic in seabirds than in earlier studies. Every year Save Our Shearwaters sends frozen specimens to the Pelagicos Lab at Hawai‘i Pacific University for necropsy studies. One result of the necropsies performed by the lab is a more in depth look into the gut contents of various seabird species. Gut content analysis provides further understanding of species diet and sustainability in the future.